Forest Park is a 538 acre park in Queens, and good half of it is pretty literally a forest: no playgrounds, ball fields or lawns, just a forest with some walking paths, bisected by a pair of rail lines. 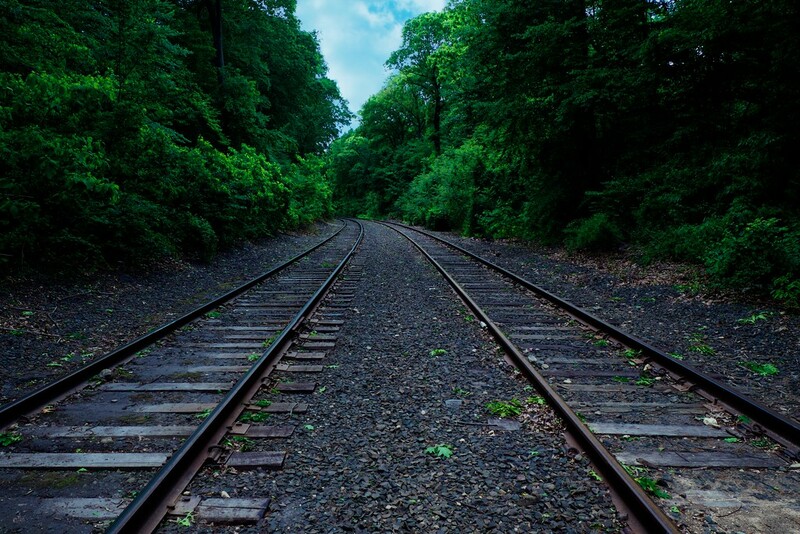 This is the Lower Montauk Branch of the Long Island Rail road. It once carried passenger traffic but those days are gone. It was a situation where low ridership led to reduced service, which further reduced ridership (nobody wants to rely on spotty service). I believe the death spiral ended last fall. Now the tracks are used only for very occasional freight traffic. This particular is so heavily crossed by pedestrians that you can see the footpath in satellite photos, even though I believe the crossing is unauthorized. The second rail line is the Rockaway Branch, which has been completely unused for more than 50 years, and heavily overgrown. * The other section of the park does have various amenities, including a golf course, historic carousel, a bandshell and other features.